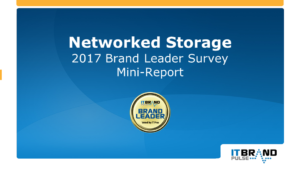 SAN DIEGO, CA—February 1, 2017—IT Brand Pulse, a trusted source for research, data and analysis about data center infrastructure, today announced the results of the recent IT brand leader survey covering Networked Storage products. Dell EMC, along with the acquisition of EMC (last year’s runner-up in this category), once again topped the iSCSI Disk Array charts by winning a seventh straight Market Leader honor, as well as all remaining titles (Price, Performance, Reliability, Service & Support, and Innovation). With Dell and EMC merged, NetApp moved up a notch from 2016 to take second-place Market leadership, with HPE next in line. Combining forces in yet another seven-year-in-a-row victory, Dell EMC picked up where EMC left off as the dominant champ in Fibre Channel Disk Arrays. Respondents also chose Dell EMC as the Price, Performance, Reliability, Service & Support, and Innovation leader, besting both NetApp and HPE—the number two and three leaders across the board, respectively. Dell EMC continued its sweep of all six leader awards—Market, Price, Performance, Reliability, Service & Support, Innovation—for Deduplication Backup Target Appliances (the third time in as many surveys). As in the other product categories, NetApp followed in the next Market position with HPE, third. Back on top after a one-year hiatus as CNA Market Leader, Emulex (now part of the Broadcom/Avago family) regained this title in 2017, marking the sixth instance IT professionals have recognized them. Cisco (last year’s choice but second place this year) did manage to disrupt the survey results by splitting up the other honors: Broadcom/Emulex as Performance and Innovation leader; Cisco for Price, Reliability, and Service & Support. Cavium/QLogic finished third in Market leader competition. Broadcom/Emulex broke up a seven-year lock on Fibre Channel HBA Market leadership—held by Cavium/QLogic— and bolted to the top of Price, Performance, Reliability, Service & Support, and Innovation. Cavium/QLogic and ATTO rounded out the number two and three Market Leader award, in that order. “We are honored to be recognized by our customers and peers as the industry leader in Fibre Channel HBAs. Customers are modernizing their datacenters with solid-state arrays which require higher speed Fibre Channel networks. A key reason why customers are selecting Emulex HBAs by Broadcom is because of our Dynamic Multi-threaded, Multi-core Architecture which offers up to a 3X performance advantage over the competition,” said Brian Reed, vice president of marketing, Emulex Connectivity Division, Broadcom. NetApp emerged as one of three dual-category Market Leader winners in the 2017 Networked Storage survey, capturing NAS Disk Arrays (7th year) and Unified SAN/NAS (4th year). For NAS Disk Arrays, voters also selected NetApp for Price, Performance, Reliability, Service & Support, and Innovation. 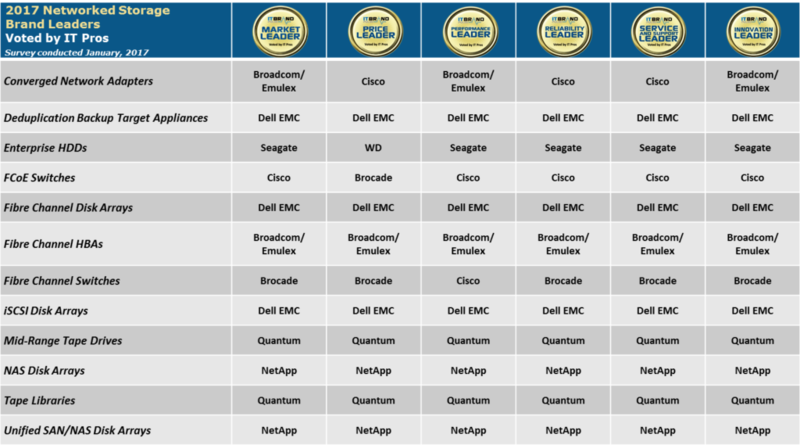 Dell EMC ended up ahead of HDS, for all-around leadership. Repeating Market Leader survey results from 2014, 2015 and 2016, NetApp again added Price, Performance, Reliability, and Innovation awards and, this year, took back Service & Support. Dell EMC easily nailed the second Market position, in front of HPE. By nearly a 2-to-1 margin, Seagate, outperformed second-place challenger (Western Digital) to capture its fifth Market Leader award for Enterprise HDDs. Seagate was also named Performance, Reliability, Service & Support, and Innovation leader with WD collecting Price. HGST was the third Market finisher. “Seagate is pleased to be recognized by IT Brand Pulse for the past five years as the top Enterprise HDD leader from this prestigious group of Data Center professionals. It’s in our DNA to engineer, build and deliver innovative, reliable high performing hard drives that meet the storage efficiency needs of both on-premise and cloud data centers worldwide”, said Barbara Craig, Sr. Product Marketing Manager at Seagate Technology. Cisco seemingly has a complete monopoly on FCoE Switches, in the minds of respondents, increasing its run to eight years as Market Leader. In addition, Cisco earned Performance, Reliability, Service & Support, and Innovation. However, Price Leader continues to go to Brocade (since 2015) as well as the number two all-around slot, trailed by Juniper. Quantum—for the sixth time in as many surveys—scaled the Mid-Range Tape Drive leadership board, cleaning up honors for Market, Price, Performance, Reliability, Service & Support, and Innovation. IBM and Oracle pulled in the next two Market spots, accordingly. A new leader surfaced for Tape Libraries as Quantum unseated reigning champion IBM to recoup the Market Leader title (lost in 2014) and tally a third year for this award. IT pros tapped Quantum for Price, Performance, Reliability, Service & Support, and Innovation. Overall runner-up IBM secured a comfortable margin over HPE. Another seven-year Market Leader winner in these brand leader surveys, Brocade, also laid claim to Price, Reliability, Service & Support, and Innovation achievements for Fibre Channel Switches. Cisco —the only other competitor listed—received Performance Leader. IT Brand Pulse awards are the symbols for brand leadership. Winners are voted by global IT pros in surveys that are independent, non-sponsored research. The surveys are designed to measure the pulse of brand leadership in specific product categories. Within each product category, respondents choose the overall market leader, as well as the leader in price, performance, reliability, service and support, and innovation. Voters are provided with a category description at the start of each product section, a randomized choice of vendor answers, and the ability to write-in a vendor, if not listed.